The self-adhesive security labels are designed to protect against tampering in a wide variety of sealing and identification applications. 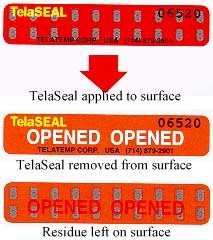 These seals reveal evidence of tampering by leaving two highly visible and permanent patterns per label which spell the words "OPENED" when partially peeled back or removed. The security labels adhere to most surfaces and result in permanent, conclusive evidence of tampering even when subjected to heat, solvent, cold or mechanical removal. They provide additional security through a repeating geometric pattern within the construction of the label. A tampered with TelaSEAL reveals the loss of the repeating patterns and shows the presence of the words "OPENED", even if repositioned. The security labels are ideal for sealing cargo, containers, packages, bags and pouches while in transit and storage as well as for identifying equipment for quality assurance, inspection, calibration, asset control and warranty registration; and for sealing storage cabinets, equipment service panels, doors, inventory and supplies. These labels are constructed of tough three mil polyester with a 50# paper liner and high-strength, instant bond adhesive. Combined with proprietary chemicals, they form a strong and secure tamper-evident 2-1/2 in. x 1/2 in. self-adhesive label. Telatemp Corporation, 351 S. Raymond Avenue, Fullerton, CA 92831. Tel: 714-879-2901; Fax: 714-870-8136.